In Disney’s heartwarming live action adventure, the young boy who shared countless adventures with his stuffed animal friends in the Hundred Acre Wood is now grown up, living in midcentury London and dealing with the stresses of adulthood. Now it is up to his childhood friends to venture into our world and help Christopher Robin rediscover the joys of family life, the value of friendship and to appreciate the simple pleasure in life once again. 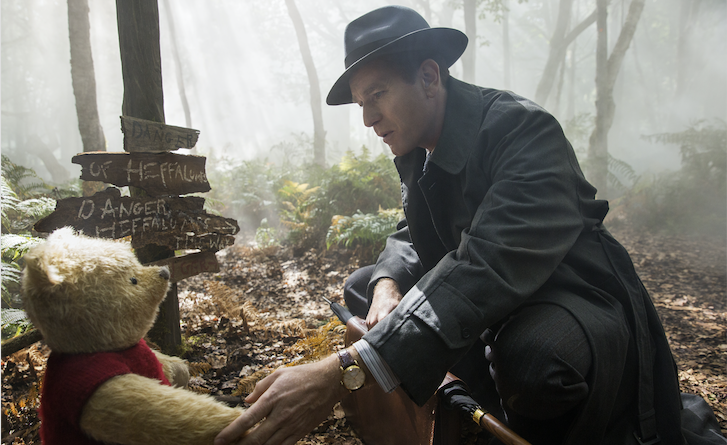 “Christopher Robin” is directed by Marc Forster from a screenplay by Alex Ross Perry and Tom McCarthy and Allison Schroeder and a story by Greg Brooker and Mark Steven Johnson based on characters created by A.A. Milne and E.H. Shepard. The producers are Brigham Taylor, p.g.a., and Kristin Burr, p.g.a., with Renée Wolfe and Jeremy Johns serving as executive producers. The film stars Ewan McGregor as Christopher Robin; Hayley Atwell as his wife Evelyn; Bronte Carmichael as his daughter Madeline; and Mark Gatiss as Keith Winslow, Robin’s boss. The film also features the voices of: Jim Cummings as Winnie the Pooh and Tigger; Brad Garrett as Eeyore; Toby Jones as Owl; Nick Mohammed as Piglet; Peter Capaldi as Rabbit; and Sophie Okonedo as Kanga.